On the birthday of the People’s King, 1873 / 2015. I ko lakou Moi hou. 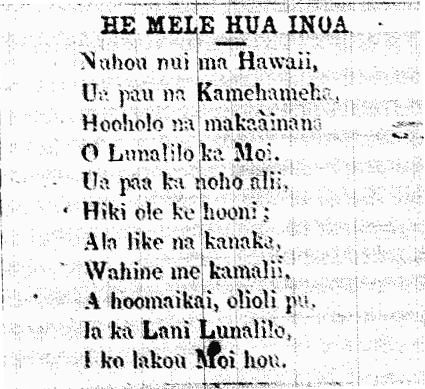 [On this, the 180th birthday of King Lunalilo, I am putting up this short and simple name song for him printed in the newspaper Nuhou following his election to the throne. Nuhou, Volume II, Number 23, Page 1. October 14, 1873. Queen Liliuokalani travels to Kalawao, 1891. Journey of the Alii, Queen Liliuokalani, to the Colony of Kalawao. Queen Liliuokalani, Prince Keliianaole [Kalanianaole], Prime Minister Sam Parker, President D. Dayton, Agent of the Board of Health, Lalana, Hon. J. Nawahi, Hon. L. W. P. Kanealii, Hon. D. W. Pua, Hon. J. K. Hookano, E. Lilikalani, Hon. J. G. Hoapili, French Commissioner, Portuguese Commissioner, Mr. and Mrs. C. Clarke, Joseph Heleluhe, Mrs. Limaheihei, Mrs. Pamahoa Kalauli, Mr. and Mrs. S. M. Kaaukai, Mrs. L. Keohokalole, A. Mahaulu, Bishop Wills, Father Leolono, J. N. K. Keola, G. W. Kualaku, Tamara Meekapu, Mr. and Mrs. Auld and daughters, Mr. and Mrs. Ailau, Band Master Berger and 31 band members, two haole women, Mrs. Makanoe and father, Mrs. Kuihelani, Mahoe, Malaea Kaaipeelua, Lula Kahelemauna, Mrs. Akau and the many others for whom I have don’t have their names. The ocean was fine, there wasn’t much wind, but there was enough wind to carry the favorite one, landing before her makaainana who suffer in pain. The light of the queen of the night shown down beautifully; the wheel of the princess, the younger sister, Likelike [referring to the ship], pushed against the sea of Kaiwi, the beloved sea, like a child carried before the friends in misfortune; eyes searching the tips of the waves for land, with sorrowful tears for their birth land. At 6 in the morning, on Monday, April 27, 1891 they landed at the harbor of Kalaupapa. The mast in the aft of the Likelike flew the crown flag, announcing here I am with a heavy heart for all of you. The town of Kalaupapa was spread out before us, from the seaside to the uplands, with cliffs surrounding, lined up on the west side of the town. 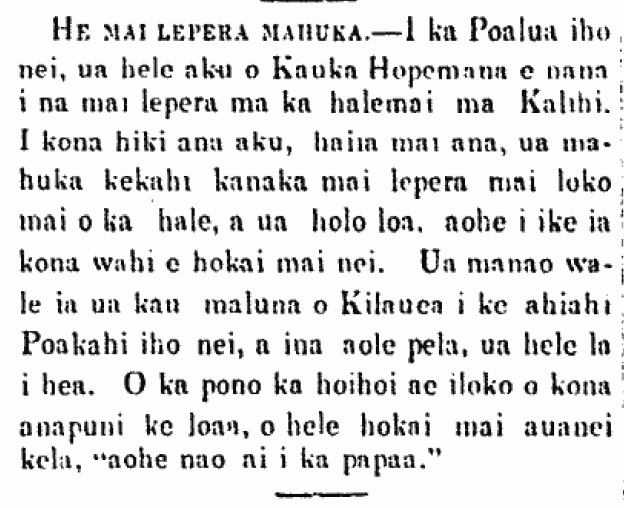 More on the pidgin in Kalaupapa article, 1882 / 2015. Before getting to the pidgin phrase in question, I had a question in the last paragraph which in the original read: “ke hele la a mauakea i ka la.” And thankfully there was a response. The white-haired old men of Kalaupapa are out surfing these days, resembling white-feathered chickens under the sun. Also there was another comment just a few minutes ago! In our Cummings Ohana I have written of many of our ancestors exploits. But these long overdue articles brings to mind an early story of our Patriarch Thomas Booth Cummings who was so inspired by a hapa Hawaiian who served alongside of him in the jury pools of Edwin Miner’s court in Lahaina (1848-50) that he named his first born son after him. The young man who had such a promising will to help the needy was William Humphreys, who often went by the name Ulawalea as a pen name when writing the countless articles in Hawaiian Nupepa about the injustices of the peninsula. Kalaupapa has received much of the attention, in part from Father Damien. However, there was a second smaller colony at the eastern end of the peninsula at Kalawao. Most patients here were Chinese, and this is where Humphreys concentrated his efforts in the early until his untimely death from a prescribed medicine in the mid 1860’s. He might have been one of the first to use the media of his day to educate those in the islands that were unaware of the seriousness of the conditions. At Kalawao he organized voting blocks, book clubs and taught many years for no expense. He served two terms as Sheriff and was imprisoned twice, once for refusing to arrest patients for victimless crimes and another for butchering beef on a nearby ranch to provide fresh meat for the starving. He like many others, worked under the radar and was but a small foot print in Hawaii’s history, but when passed the patients of Kalawao lost their dearest friend. Mahalo to everyone that gave responses, they put much more meaning into this post! 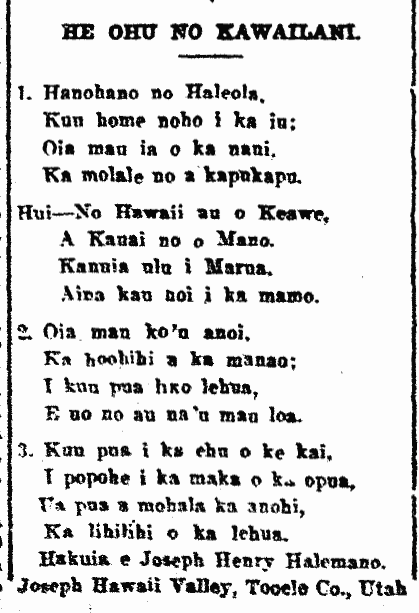 Another mele for Kawailani, 1913. Ua like no me na lehua o Panaewa. Ka iini no ia la o ka ike. He nani ia la he nohea i ka maka. He ala onaona hone i ka poli. Hakuia e Joseph Henry Halemano. Joseph Hawaii Valley, Tooele Co., Utah. Ka Nupepa Kuokoa, Buke XLIX, Helu 3, Aoao 6. Ianuari 17, 1913. 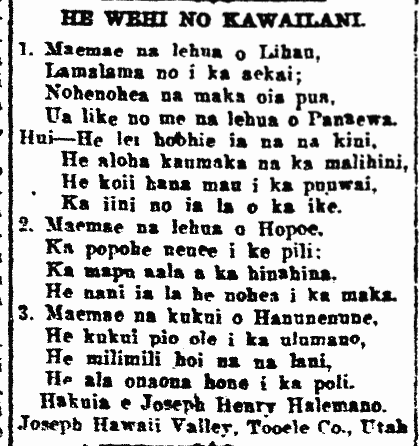 One more mele for Kawailani, 1913. Ka molale no a kapukapu. Aina kau hoi i ka mamo. E uo no au na’u mau loa. Ka lihilihi o ka lehua. Ka Nupepa Kuokoa, Buke XLIX, Helu 2, Aoao 6. Ianuari 10, 1913.